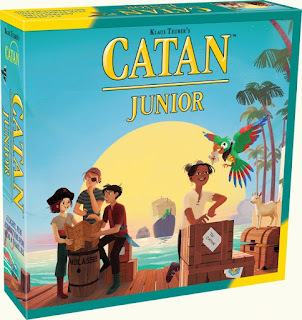 From Mayfair Games come this fun Catan game for kids ages 6+. In Catan Junior kids are pirates going from island to island setting up their Pirate Camps that gain them valuable resources (called equipment cards). Use these equipment cards (wood, barrels, swords, goats, and gold) to build additional ships, build Pirate camps, and purchase Coco Help Cards. In order to get to the islands, players must build a chain of ships from island to island. Players may also solicit the help of Coco the Parrot by purchasing Coco Help Cards and may trade their equipment cards with fellow players. As you're sailing along just beware of the Ghost Pirate as he will keep you from getting your valuable resources but drive him out and you'll get to claim the Ghost Castle as yours. Be the first player to build seven Pirate Camps and you'll win. Very easy to play with our 6 (almost 7!) year old; also very Catan-like. Glad we picked it up! Benjamin - Glad you and your child are enjoying Catan Junior. We have had others express the same comment. And, what a great way to introduce young minds to strategy games.